Just look at the trend line of "nones" (many,but not all, who are atheists) since 2010. It is a straight up shot, and coming from all areas, but especially the evangelicals are losing members. Does this mean sanity is now valued? Perhaps. Although there is no question that there are many atheists and agnostics in the "none" group, there are also still some who have a believe in some god or gods. However, it also seems clear that it is the first step towards rational thinking once people remove themselves from an organized religion. I've been an atheist for decades, but it took me a long time to even self-identify myself as such. I suspect I am not an anomaly. At any rate, I see this as the real "good news". How in the hell is Catholicism going back up merely because they accepted evolution? Or is it immigration? 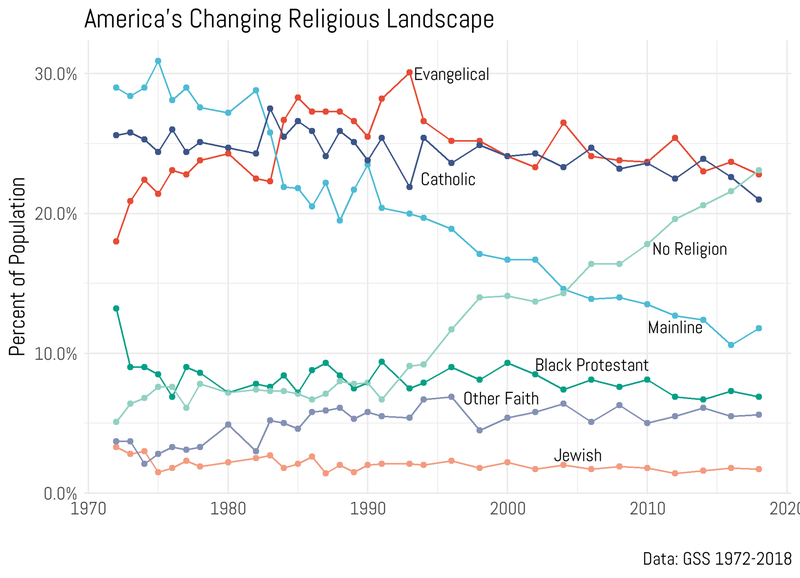 I think the chart shows Catholicism is in fact declining. I see two good trends - Evangelicals are down and Mainline Protestants are up. That..uhhh...looks encouraging, but I won't uncross my fingers until irreligion becomes a social platform that is aware of itself and its' political clout and uses it. Then I might say "Mission accomplished". Incidentally, isn't this more an A/A thread? In R/S, it looks less like 'lookin' good, heathens' and more 'In your face, godsuckers'. Last edited by TRANSPONDER; 03-30-2019 at 11:33 AM.. I am now confused. What is the theological difference between a black protestant and any other protestant? Not really. We're now in a nation where truth is relative. That is not sane. If your only definition of sanity is rejection of Evangelical Christianity, in what it's become today, then your definition is woefully short. I don't know about any theological differences but I think music plays a more important role in black services. In many circles it may mean a difference in the things that are focused on. Many black churches (not all) tend to embrace a "Black Liberation Theology", or a focus on social justice over the traditional, historical essentials of the faith, such as Christ crucified and risen. The Internet was the final nail in the coffin of Christianity. The net opened the truth about the shady underhanded dealings of the church and its corrupt leadership to the entire world. People now can research such topics as "Jesus never existed" and "Ten Reasons The Gospels Are Works of Fiction" and get the complete lowdown on Christianity's nefarious creation.